Moms Helping Moms Foundation, Inc., a non-profit charitable organization has been helping families who face financial distress help meet their babies’ basic needs. Whether it’s providing access to essential baby supplies or connecting moms with a variety of services to support them during pregnancy and the first three years of parenthood, such as parenting support, child development education, financial literacy, and health and wellness. When founded in 2011, the idea was that no baby should have to go without life’s basic needs. Through partnerships with community organizations, schools, local government and others, Moms Helping Moms has collected and distributed tens of thousands of diapers, clothing, formula, nursing supplies, and countless other baby essentials to hundreds of families in New Jersey. Six months ago Moms Helping Moms paired with Homeless Solutions, Inc., in Morristown, which began as Morris Shelter Inc. in 1983, created as a private, not-for-profit, tax-exempt organization. It expanded to Homeless Solutions, Inc. and provides shelter for homeless men, women and families. Homeless Solutions sends Moms Helping Moms a “wish list” for women with children ages three and under. Then Moms Helping Moms is able to provide the organization with diapers, strollers, and clothing; filling in the gap of what food stamps don’t cover. 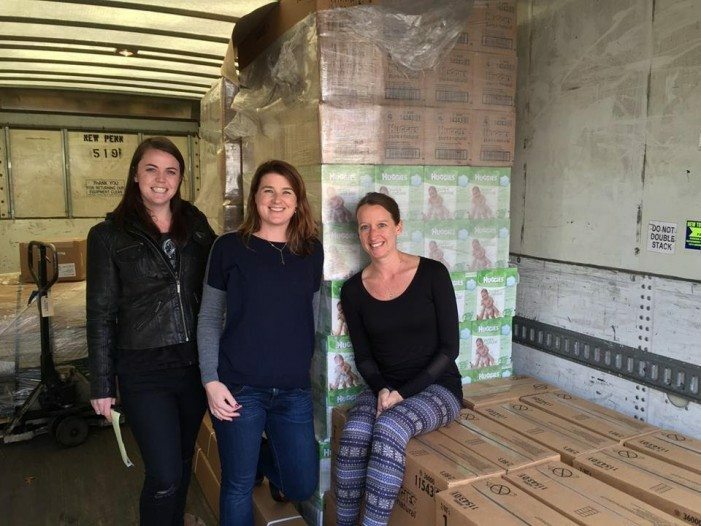 Moms Helping Moms recently obtained a $2,500 grant from National Diaper Bank Network. They were one of 29 national recipients of the inaugural Funds for Change grant. Cutler plans to use the money to re-organize their space, allowing for more inventory storage and to streamline their operational procedures. Most of the operational work is done by Cutler and Megan Deaton, who works as secretary. On Jan. 29, they had their second annual Snow Ball fundraiser at Stone House at Stirling Ridge in Warren. Since their first diaper distribution in 2011, Moms Helping Moms has helped provide close to 100,000 diapers, as well as other essential baby supplies, to hundreds of families in NJ. For more information, visit: momshelpingmomsfoundation.org.